We are pursuing customers' safety and convenience. Since we had established the company, we have been manufacturing products with high safety and hygiene. 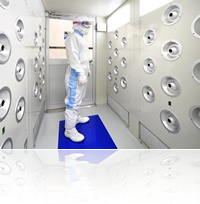 Today, our high-grade cleanroom facilities contribute to our high quality products very well. In the front chamber, air shower blows out dusts from our clothing. The front chamber separates the clean area from the non-clean area, protecting the production facilities in highly clean state. 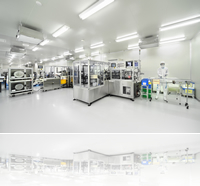 Air pressure difference between inside and outside the cleanroom is automatically controlled using air pressure sensors. 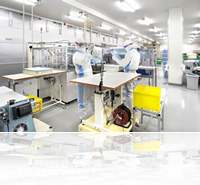 Cleanrooms are managed to be at a positive pressure in order to keep high hygiene. 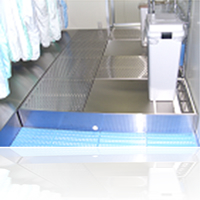 Air inlet on the clean stage inhales dust dropped from clothing, keeping the clean area clean.